Over the past few years, I’ve been predicting two things will change dramatically about climbing Everest: 1) It will get more expensive and 2) China will make it more difficult to climb from their side. A recent announcement by Chinese Mountaineering Association and Mountaineering Association of Tibet aka CTMA has shown both to be true. China has informed operators that effective January 1, 2019, several new rules will be put in place: “expedition formation, audit, reception, management, safety and environmental protection” for mountain expeditions on Cho Oyu, Shishapangma and, of course, Everest. If implemented and enforced, this is a big deal. Formation of Expedition – Blocking Nepal? This suggest that the CTMA can select which companies they want to run climbs in Tibet and block others. The criteria are quite subjective and could be an invitation for corruption. I’m not sure I understand this one as the overall tone of the new rules seem to be designed to block Nepal companies and promote Chinese ones but this clause suggest a 1:1 ratio of climber to Nepali i.e. Sherpa guide. Perhaps they mean Tibet or Nepal Sherpa? Again, this can be very subjective and invites fraud and corruption by the CTMA if they choose to punish an expedition by not returning their deposit. Also, strictly interrupted, does this mean if you have an “accident” you loose your $5,000? Not a big deal but “deadline for the expedition’s registration will be 28th February in spring,” so no last minute chance to join a climb. This is a price increase as the $1,500 per person is not a deposit but rather a fee on top of the $9,500 permit fee. China now matches Nepal at $11,000 per person permit fee. However China includes more with the permit for example transportation to base camp by vehicle. This is something that has been on the books on both sides for a while but not enforced in Nepal. Not sure what falls under “mountaineering rubbish” definition. Unclear if it will be enforced in Tibet or used as an excuse for not refunding the $5,000 trash deposit. Mountain Rescue – YOU Pay Unlimited Expenses? Similar to other big peaks around the world, this centralizes the rescue operations under one management structure. Interesting that the Chinese guide company, Yarlha Shampo Expedition, was chosen. By the way “Yarla Shampo” is also the name of a mountain in Tibet. This is the kicker. If you need a rescue, you are 100% responsible for paying the expenses. It will be interesting to see what the insurance companies say about this but as in many things in China, they will have little say in the matter. I guess the bottom line is don’t get in a situation where you need a rescue in Tibet! 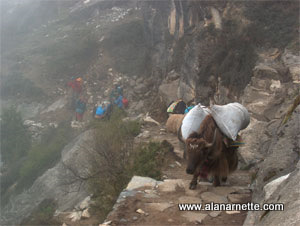 In my mind climbing in Tibet has just become more expensive and more controlled. While the intent of some of this is good (trash, centralized rescue) others are onerous in nature and can result in unexpected expenses. Finally, climbing Everest from the North or Tibet side was historically seen as cheaper, wilder, freer and more independent than the Nepal side. Well, that ship has sailed. If you want a more independent 8,000-meter climb, Everest is no longer on the table. Take a look at Makalu or Dhaulagiri. As always when climbing in China, climber beware.